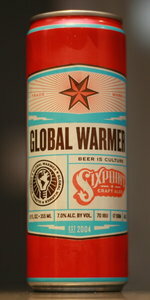 An Imperial Red ale of global proportions, rich with toasted malt and enough bright hops to warm you through the winter. "Best by 4/23/15"; drank 11/25/14 @ the Yarchives. Mild orange citrus nose; faint hints of bread. Bitter grapefruit & stake bread flavors up front; mild macro-lager finish. Aroma is hops and some spice. Light Amber color, lasting white head. Loses points for being a little too hoppy for a winter beer. Also get pine, sourish resin, tar." Look: Thin, cream-colored head ring, and a bat-shape of lace. Burnt amber center, light orange at the edges. Smell: Fruity hops (grapefruit comes to mind), malt. Taste: Up front hop fruit, biscuit malt back. Sweet, with tropical bitterness. A nice red with some great balance. A fruity, hoppy bomb of beer. Poured from 12oz can into glass. Canning date of '20FEB2017'. Only described as an 'ALE' on the can. Hazy, red amber body. Frothy white head settles to interrupted head, and moderate lacing. Smell is tropical and piney hops, biscuit malt. Spicy taste, mostly of piney hops, some tropical in the middle, strong malt underlying throughout. Sweetness at the end. Coats the mouth, slightly bitter to smooth. Touted to be a beer to "beat back raging storm clouds". A winter warmer of a different sort. It works. Ruby red with an unblemished tan froth. Smells of citrus, pear and herb. Grain up front with light fruits, faint grapefruit and grass following. Light to medium in body. Pairs well with An Inconvenient Sequel. The appearance is a hazy golden amber colored body with a slim one finger white foamy head that dies within about a minute; some adequate foamy lacing that tries to cling but ends up sliding into the body; the aroma mainly bitter, now is that hops or is that just plain bitterness for the most part, to me at least its just coming across as plain bitterness, not really getting much hops for the most part; I will say this, some caramel malts do come out as it warms; the taste is mainly bitter again, and those caramel malts do try to make a presence, but end up making a sly subtlety to help balance it just a tad; bitter dry aftertaste and finish; on the palate, well, its a sort of between the light to medium and it comes across super dry in the mouth and tongue; overall, hey, not a bad American Amber/Red Ale that wants to be an Imperial Red Ale.